Welcome to the Design Your Dream Life series! If you’re new here, this is a series where I interview people who have designed their dream lives. You can find all the interviews on the Design Your Dream Life Page. I am soo excited to have Rachel on the blog today to share her story of designing her dream life as a blogger on Instagram (in the shortest time ever, too!). Can we just take a minute and acknowledge how amazing this sounds?! She legit had a few thousand followers and now has over 200k! Nuts. Side note – If you want to jump ahead and do what Rachel did, you can see Rachel’s inst course here – Beat The Algorithm. I had to constantly update my calendar with new slots for new clients! It felt so relieving to have my calendar booked up each week, and to know I was helping people lose unwanted pounds. What was your life like before all this that led you to make a change? A busy, frantic, stressed out mess! Part of this though, was due to still being in school (I just graduated mid-May from a PhD program), and working full time in an internship that was a 2 hour commute each way! I work from home and absolutely love it. While I know the goal for many bloggers is to travel the world, I’m actually more introverted and more of a homebody – I love to relax in my personal space and be in a daily routine. YOU GUYS RACHEL TRIED TO SKIP THIS QUESTION AND I WOULDN’T LET HER BECAUSE I’M A HORRIBLE PERSON. As in 100 hours per week. Living life on your terms doesn’t mean not working. It means working your face off sometimes, particularly in the beginning, which I call startup mode. I see waaaaay too many people fall in love with the lifestyle instead of falling in love with the work. You have to fall in love with the work first to get to the lifestyle. That is how you get results. This is the truth. When I was in high school and college, I was SO confused with what to eat. I yo-yo’ed a good 15 pounds. I tried every diet. The cabbage soup diet (for 2 hours), a vegan diet, super restrictive diets, and also crazy diets that I made up in my head, like trying to eat a mountain of lasagna and nothing else the rest of the day. I was very unhappy with how I looked and didn’t know what to do to change it. Since I was thinking about food all the time anyway, I switched my major from math to nutrition midway through college so I could understand the science behind what I was eating. This did help me finally understand both the scientific and psychological aspects of what would keep me full, satisfied, and at the healthy weight I felt most comfortable at. But I wanted to help OTHERS find these realizations, be free from the misinformation on weight loss that’s online and on social media, and ultimately to manage their weight in healthy, fulfilling ways. At the time, there were a lot of nutrition education materials on what to eat for people with diabetes, heart disease, high blood pressure, etc., but there was nothing for my age group that helped tell the truth about food! So when I graduated from my bachelor’s and master’s from Case Western Reserve University in spring 2013, I started the website and social media accounts for “The College Nutritionist”. 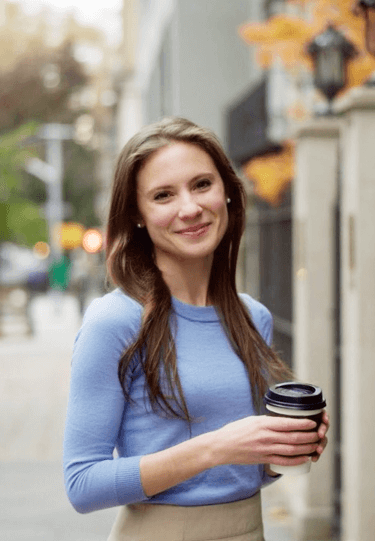 A few months later, I came to NYC to start my PhD at Columbia University in Behavioral Nutrition – a mix of psychology and nutrition, or, how to communicate effectively & change people’s food behaviors. With a little extra time on my hands, I started posting recipes on Instagram and my blog. But Instagram was different back then! It was much easier to grow. 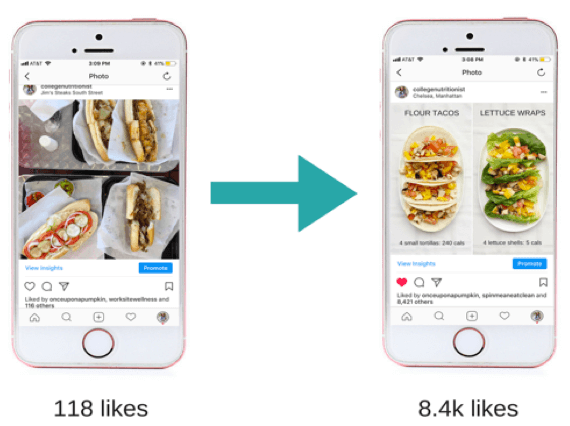 Pictures appeared in chronological order – your followers were shown all of your posts (versus now, when followers are only shown your posts if they view, like, or comment on your pictures often). The (dreaded) “algorithm” wasn’t in place, and I was pretty easily able to grow to 17k followers. Working around the clock, running my own experiments and managing my boss’s studies to get publications, running to Queens to be an adjunct instructor, and working as a part time nutritionist at a private-practice to afford my rent. During this time, College Nutritionist really fell by the wayside. I just didn’t have the energy or time to devote to it in any capacity. I knew I would come back to it, but just had to take a break. I make money in three different way. First, I’m a virtual coach to help people lose weight. Second, I work with companies to do promotions with their (primarily food) products. And finally, I coach people with Instagram and also sell my course, Beat The Algorithm, where I teach people how to do what I did on Instagram. How long did it take for you to make $1k per month? I knew I’d be leaving my research job at Columbia to work in an internship for a few months, and I’d have a little more free time. I had an aching guilt about The College Nutritionist – I knew there was serious potential there, as it was a strong niche or section of the total market that I could specifically target. I began posting on my blog nearly daily. I wish I could tell you everyone loved my photos, and I was an overnight success. I can’t tell you how much further from the truth the reality was! I posted (what I felt like were very) beautiful photos, and would get less than 100 likes. Truly embarrassing since I did have thousands of followers at this point. It seemed like no matter what I did, my engagement and growth wouldn’t budge. I signed up for Six Figure Blogger and a mastermind weekend workshop, which reminded me of the power of TALKING to my audience to figure out what they want. After spending some time really learning what my audience wanted, I was able to figure out what they wanted from me most. This truly was the turning point for me. I changed my bio and my content to EXACTLY focus on addressing my audience’s desires, or, as I learned, what entrepreneurs call “pain points” (people are more likely to seek help to solve their problems than they are to look for something preventive). My engagement immediately began to jump, and with trial and error, I began developing more creative content that addressed college students’ & recent grads’ “pains” – those areas where they wanted help. By implementing these strategies I was able to get better brand deals with companies and reach $1k month in promotional work. How long did it take for you to make six figures per year? The next financial burst was much more quick! The growth since December has been exponential. I grew from 20k to 162k followers in 6 months, and my photos consistently get thousands of likes. 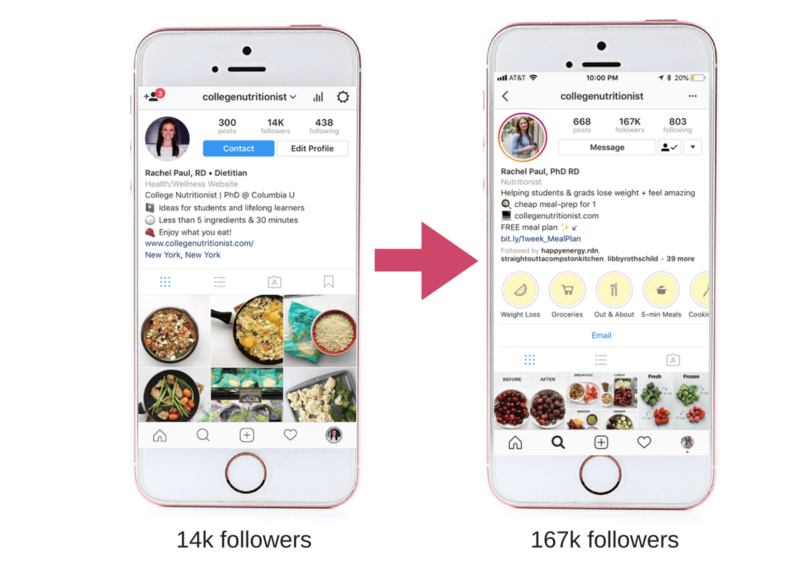 Like any social media platform, Instagram does constantly update and change, and it’s up to me to keep up with it and to come up with more and more engaging, clever content that helps my followers eat better and feel their best – ultimately solving their problems. What do you wish you knew when you were starting out? Niche down until it hurts – on Instagram, and of course, in your business in general. As Tim Ferris says, “When you niche down, it becomes less difficult for your target customer to find you, and easier for you to charge a premium price”. What advice would you give to someone who is starting out and wants to design her dream life? Don’t put yourself in a bad financial situation, but if you can afford it, absolutely spend the money on a course, a mastermind group, or a coach. It is a mistake not to. Personally, I always am working with a coach or a group. I may change this coach or group from time to time, but I am never working on my business on my own. When we’re deep in the trenches of our own work, it can be hard to step back and see the big picture. That is where others can come in and can give you ideas you would never have thought of. Where can people find you if they want more? I’m online at collegenutritionist.com and @collegenutritionist on Instagram. I love love love Rachel! She’s amazing. Her story is amazing. Her success is amazing. She is amazing. I really like when she says niche down until it hurts. This is such good advice. I also really love how she says to invest in yourself. This has been so true for me. Six Figure Blogger had a huge impact on me going from $3k-$4k per month to six figure blogger status. I can’t recommend investing in yourself enough. THANK YOU Rachel for taking the time to do this interview and sharing all this awesomeness with everyone. Are you inspired by Rachel?! Let her know in the comments! You can also get free course sent to your email – just add your email to the form below! Thank you so much Natalie!! I feel so lucky to be connected to you! Amazing how niching down and focusing on your customer’s pain points can give your business such a boost. Something to really consider as I start my blog. Thanks! Yes, it’s so true! When you can pick a broad topic that’s super popular, then niche down like crazy, you can really explode your business! I came here from Create and go. I am happy to be here and checked a few posts of you which are really useful for me. You are doing a great job. I would love to connect with you. Keep supporting small bloggers like me. I am new here but a long way to go. I loved Rachel’s story. Hard work definitely pays off. Many people are missing out on how they can use Instagram to grow their business.